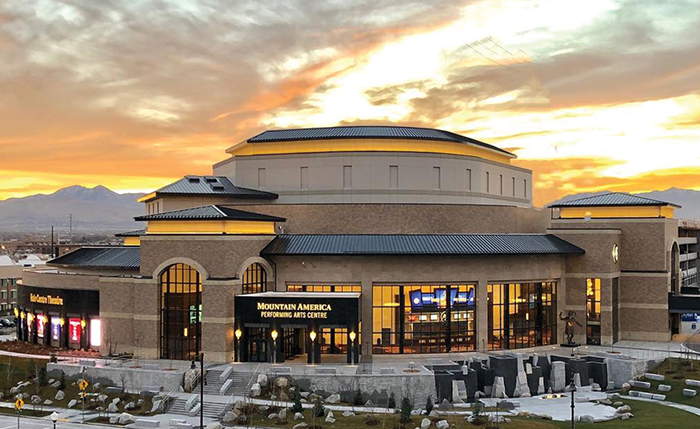 Located near Interstate 15 and Sandy River Airport, the new $80 million Hale Centre Theatre in Sandy, Utah, was designed by architect Lyle Beecher to restrict outside noise. Twenty Acoustical Smoke Vents manufactured by The Bilco Co., New Haven, Conn., feature an STC- (sound transmission class-) 46 rating. Each vent is equipped with a Thermolatch® II to ensure operation and passive smoke ventilation during a fire. Installed on the 133,000-square-foot structure by Heritage Roofing, Bluffdale, Utah, the vents are engineered with gas springs and integral dampers to assist with opening the covers in snow and high winds. Hale Centre Theatre opened in September and features two stages to accommodate 1,300 patrons, an 80-foot fly loft, ascending and descending stages, and a sound system for the hearing impaired.